Crazy Taxi continues to be a favorite among gamers of all ages, from those who played the game in late-'90s arcades to those who discovered the game later on consoles. This weekend, Sega announced their mobile version of Crazy Taxi would now be available for free. What a time to be alive. So does the arcade classic still hold up in 2017? Let's find out. If you want to download the game before reading this review, you can install it from the iOS App Store for iPhone or Google Play Store for Android. Crazy Taxi Classic plays and acts much like the original. Both arcade and original modes are here, giving the player options to play by arcade rules, or play in three, five, or ten-minute intervals. 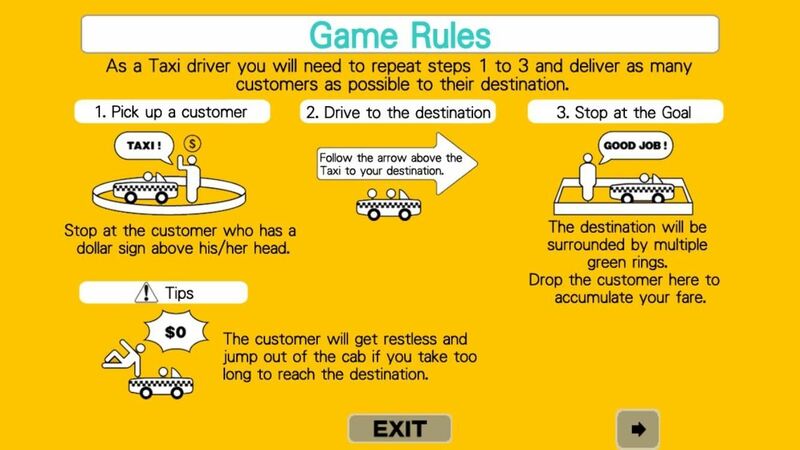 For complete beginners to the game (like myself), Crazy Taxi gives you a helpful instruction slideshow to get you acquainted with the controls. Not that there are many. 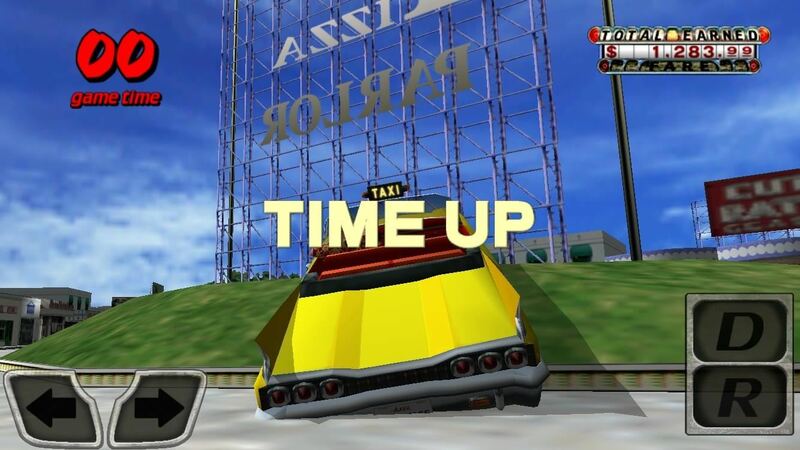 Still, it's a useful way to pick up and play Crazy Taxi without being completely useless. 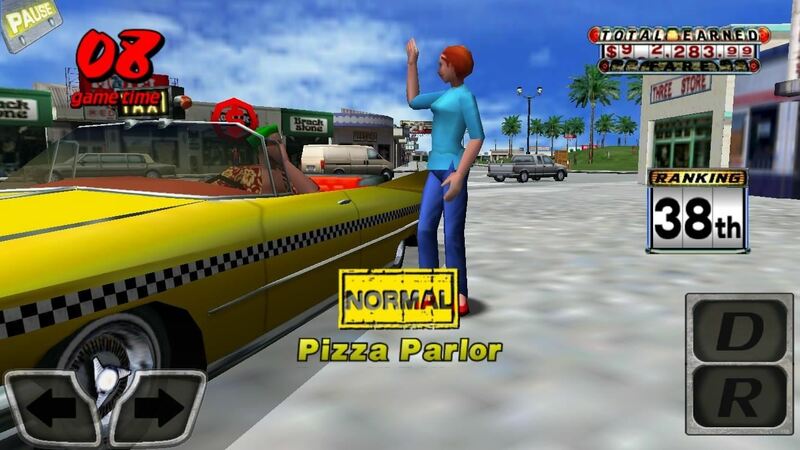 For the uninitiated, Crazy Taxi has you play as one of four different cabbies. Your mission is to pick up passengers throughout the city and to take them to their various destinations, all while being mindful of the time limit. Along the way, you aim to make some extra money by performing combo moves and getting as close as possible to other cars. It's a simple game, but it can become very addicting. Arcade mode is where you should start. Original mode drops the player into a much larger map, where the guiding arrow becomes more of a distraction than a help. Arcade is a good way for beginners who don't know the map to get a grip on how to play. Because we're playing on mobile, Sega has included both touch controls and tilt controls. Usually, unless the game design is skewed one way or the other, this comes down to user preference. Personally, I stick to touch controls because I find most tilt controls to be too sensitive. While I feel Sega did a good job with the tilt controls here, I still feel like I have more control using the touch directions; I found myself crashing into walls way more often when steering my phone left and right. That's not to say tilt controls don't have their advantages here. I found that I had an easier time making some quick turns than I did when using the touch controls. For example, reversing becomes a lot easier with tilt controls. Maybe I'm taking my instincts from real-world driving into account, which doesn't translate to reversing with touch controls. Whatever the case, I got myself out of some sticky situations faster when tilting the phone. For the most part, however, I preferred touch controls. The iOS and Android versions play similarly. I played the game on an iPhone 7 and the Google Pixel and didn't notice many advantages of one over the other. Vibration works on both platforms, which is a cool feature missing from, say, a 3DS. I preferred the vibration on the iPhone to the Google Pixel, since the iPhone's vibration is a little more subtle than the Pixel's. Nothing game-changing, but I couldn't help but be a little distracted by the Pixel. Now, to address the elephant in the room. This game is now free, which means ads. And these ads don't seem to care much for subtleties. From the permanent ad-space on the main screen to timed popups throughout the game, the ads are pretty intrusive. Sega even thought ahead to those of us who play these kinds of games on Airplane mode in an effort to cut down on the ads. 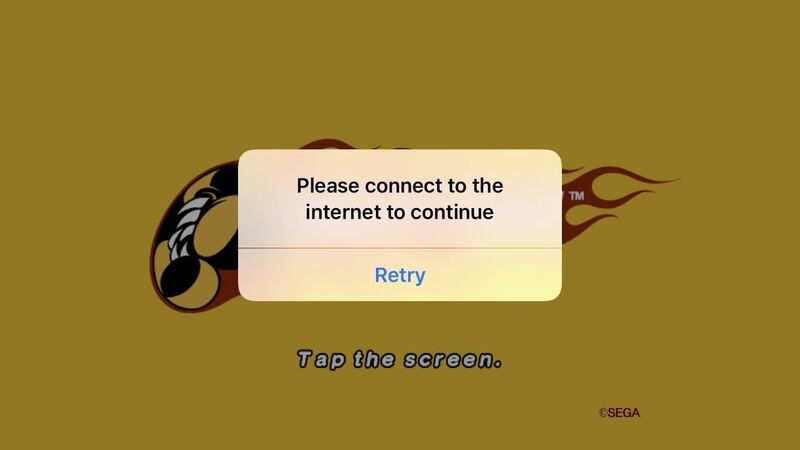 In order to play the free version of Crazy Taxi, you need to be connected to the internet at all times in order to play. A total bummer if you're trying to play in the subway, or, I don't know, on a freaking airplane. Better hope your flight has Wi-Fi. Luckily, there are no ads during the actual gameplay. This detail is crucial. 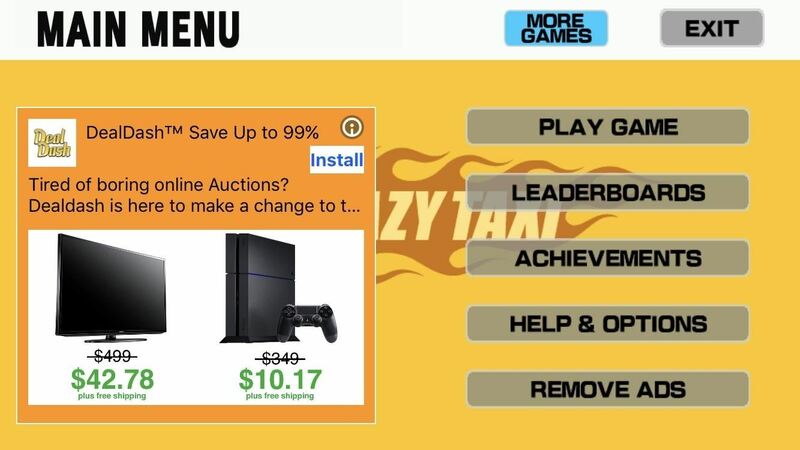 Many "free" games put the ads at the top of your game, distracting the player from what's happening on screen. Crazy Taxi at least gives you the decency to spam you once your game has ended. That detail makes the ads somewhat bearable. Ads become particularly evident when playing the "Crazy Box" mode. Here, the game offers players short challenges that usually don't last longer than 15–30 seconds. The problem is that almost every time you finish or lose the challenge, you get slammed with a new ad. This ad-placement happens at the end of games in the arcade and original modes too, but because of how short these challenges are, you potentially see three to four ads a minute. I had a hard time gathering the patience to play more than three of these challenges before getting sick of the ads. Is the free game worth it? Absolutely. You get more than your fair share of fun before having to sit through 10–15 seconds of advertisements. That's worth the free game. Ads may damage the Crazy Box experience, but if you want to enjoy this feature fully, the full game is available as an in-app purchase for only $1.99 (iOS) or $3.99 (Android). Considering PS2 games retailed for $50 back in the early 2000s, $1.99 is kind of a steal. If you're like me and have some inexplicable aversion to purchasing mobile games, Crazy Taxi is perfectly playable without having to buy it. Gadget Hacks Score: 3/3 — Great game, worth a download! 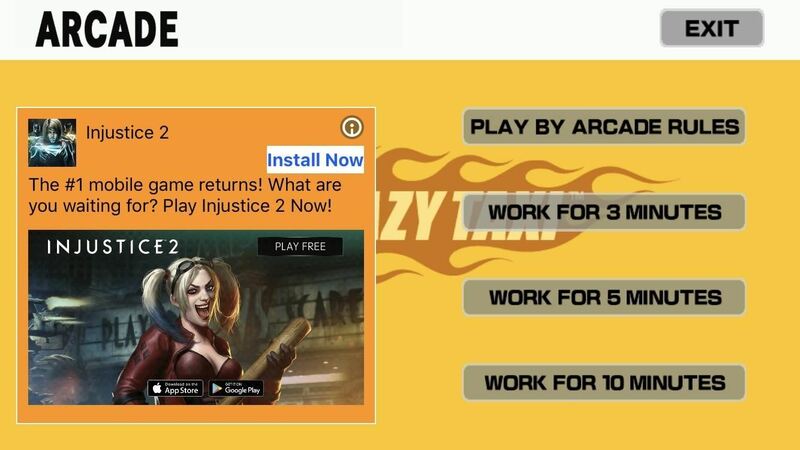 Ads can be annoying, but not as annoying as they are for other free games.